Indications are a lack of self-confidence, self-esteem or self-respect. There will be lack of strength of will and courage, along with fear of others. One may lack drive and motivation and may be dependent on others, (Usually family and friends) emotionally and materially. They are usually not very successful in life or their success will not make them feel good or there may be constant problem in office/ or with boss. The father of the native usually does not have a good fate in life or dies early or has inimical relation with the native. On the physical level, native may suffer from low energy, anemia, weak digestion, poor appetite, weak or slow pulse, and weak heart, risk of hemorrhage and poor circulation. There may be edema, accumulation of water, sunstroke and general hypo-function of the organs and nervous systems. The eyesight may be poor. There may be arthritis and weakness of bones. Ketu's aspect or close conjunctions is particularly difficult. Sun signifies East Direction. When placed in own Nakshtra, it causes fever and irritability; in the Nakshtra of Moon, native becomes temperamental and pessimistic; in Nakshtra of Mars, anemia, giddiness and marasmus; in Nakshtra of Rahu, mental disease and forgetfulness in Nakshtra of Jupiter, jaundice, rheumatism, paralysis; in Nakshtra of Mercury, migraine, neuralgias; and in the Nakshtra of Ketu it gives low B.P, enigma pectoris; in Nakshtra of Venus burning urination, cystitis and purists. Sun in its higher level, represent truth or divine self (Atma) and on the lower level, it represent ego or self image. Main solar issue is identity. Our true identity is consciousness. Our true nature is in the capacity to illuminate things, not in the things our mind illumines. What ever we are identified with is a form of darkness. 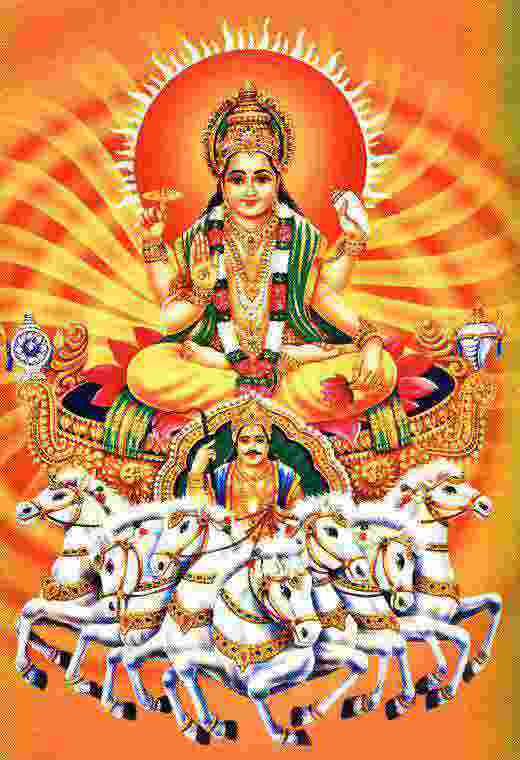 The presiding deity for Sun is fire but Lord Shiva and Sun god are also worshipped. "OM HRAAM HREEM HROOM SAH SURYAYE NAMAHA"